Experience a better shower with the control and flexibility of a Delta. hand shower. Great for showering yourself or your loved ones and pets, as well as for keeping your shower and tub clean. While other products may gather unsightly mineral build-up over time, Delta soft rubber Touch-Clean. spray holes allow any mineral residue to simply be wiped away for an instantly refreshed look with no need for soaking or the aid of chemical cleaners. The pause setting gives you ample space for shaving, lathering and other shower tasks, then easily restarts the water with the temperature where you left off. This spray setting helps you conserve water, so you can worry less about depleting your supply of hot water - and you help the environment too. Delta WaterSense labelled faucets, showers and toilets use at least 20% less water than the industry standardsaving you money without compromising performance. From the experts at Delta, this top-grade hand shower brings you a great clean from head to toe. Its terrific 2-in-1 design boosts its use, so you get an all-over clean with every shower. The 3-inch D, 28-inch H, and 3-inch W size makes sure this showerhead uses only a little space and gives plenty of water flow. The perfect blend of luxury and all-around use, this hand shower from Delta gives an amazing clean. Thanks to its 2-in-1 design, you can enjoy a full body clean. 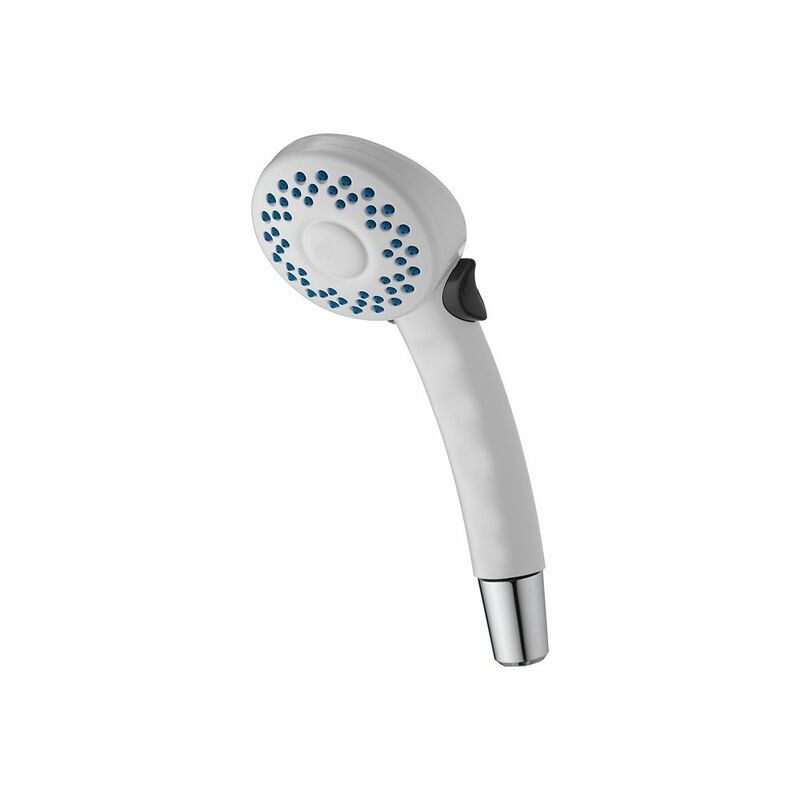 With a 3-inch D, 28-inch H, and 3-inch W size, this showerhead is small enough to fit into smaller spaces and gives plenty of water. Wash the day away with this super functional hand shower, giving you water any way you need it, anywhere you want it. The hand shower easily adjusts on the wall-mount slide bar to accommodate every user. The built-in backflow protection system incorporates two certified check valves for your peace of mind. Hand Shower, White Wash the day away with this multi-functional hand shower. We've got you covered from top to bottom, or bottom to top, giving you water anyway you need it, anywhere you need it. Innovative Pause feature allows you to conserve water while lathering up. Hand Shower, White is rated 4.5 out of 5 by 26. Rated 5 out of 5 by Skipper46 from My wife has only the use of one hand after... My wife has only the use of one hand after a stroke 2 years ago and loves being able to stop water flow and not get water everywhere. Rated 5 out of 5 by Alan from It works fine. A good shower head.... It works fine. A good shower head. Rated 1 out of 5 by Kelvin from The photo is deceiving as the shower head does not... The photo is deceiving as the shower head does not include a hose. Rated 5 out of 5 by midwestgar from We like the pause button very well since it is... We like the pause button very well since it is used on a tub/shower with separate hot and cold knobs. The temperature settings stay where they are and you can pick back up right where you left off. This feature was a "must have". It's great! Rated 5 out of 5 by HomeDepotCustomer from Excellent. Easy to install and use.... Excellent. Easy to install and use. Rated 5 out of 5 by Robert from Haven’t used it yet but it appears to be a... Haven’t used it yet but it appears to be a quality item. Delivered on time! Rated 4 out of 5 by AT from Works well enough for our RV. Don’t know that I would want it as a full time shower. Works well enough for our RV. Don’t know that I would want it as a full time shower. Rated 5 out of 5 by MMBX from This is a wonderful hand held shower spray with an... This is a wonderful hand held shower spray with an on off switch. The picture does not show the holder and hose. Are these part of this model and if so, how long is the hose.